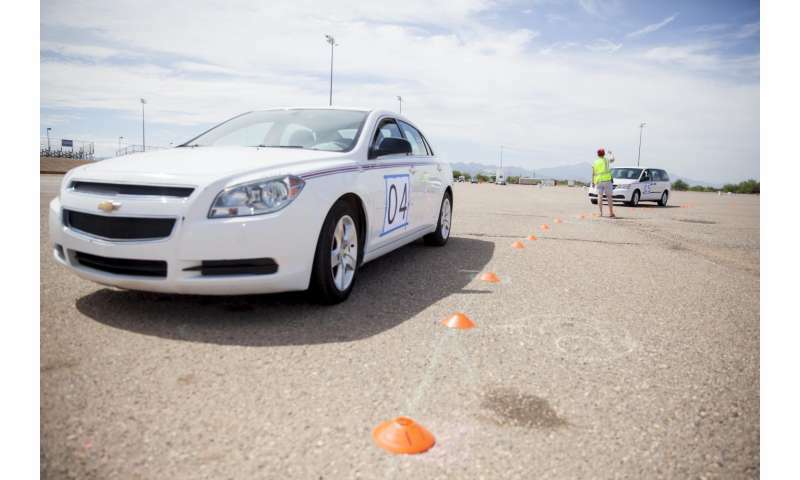 "Our experiments show that with as few as 5 percent of vehicles being automated and carefully controlled, we can eliminate stop-and-go waves caused by human driving behavior," said Daniel B. Work, assistant professor at the University of Illinois at Urbana-Champaign, a lead researcher in the study. Funded by the National Science Foundation's Cyber-Physical Systems program, the research was led by a multi-disciplinary team of researchers with expertise in traffic flow theory, control theory, robotics, cyber-physical systems, and transportation engineering. Principal investigators (PIs) were: Benedetto Piccoli, the Joseph and Loretta Lopez Chair Professor of Mathematics at Rutgers University, Camden; Benjamin Seibold, associate professor of Mathematics at Temple University; Jonathan Sprinkle, the Litton Industries John M. Leonis Distinguished Associate Professor in Electrical and Computer Engineering at the University of Arizona, Tucson; and Daniel B. Work, assistant professor in Civil and Environmental Engineering and the Coordinated Science Laboratory at the University of Illinois at Urbana-Champaign. "Before we carried out these experiments, I did not know how straightforward it could be to positively affect the flow of traffic," Sprinkle said. "I assumed we would need sophisticated control techniques, but what we showed was that controllers which are staples of undergraduate control theory will do the trick." This latest research suggests that even the related technology available now - such as adaptive cruise control - has the power to improve traffic even before there are large numbers of autonomous vehicles on the road. "Fully autonomous vehicles in common traffic may be still far away in the future due to many technological, market and policy constraints," Piccoli said. "However, increased communication among vehicles and increased levels of autonomy in human-driven vehicles is in the near future." "The proper design of autonomous vehicles requires a profound understanding of the reaction of humans to them," Seibold said, "and traffic experiments play a crucial role in understanding this interplay of human and robotic agents." If you slow traffic enough, you can certainly reduce stop and go waves. You can even prevent them at low enough speed. I recently had the misfortune of renting a car which had adaptive cruise control. I found that with the cruise control on, I was limited to going as fast as the slowest car in front of me. I had to drive without cruise control until I discovered how to turn off the adaptive cruise. Driving behind an autonomous car doubtless has the same effect of slowing all the traffic down. Most people don't want this technology and if they have to drive slower with it, they really won't like it. Nice idea, but add another lane and people will change lanes to fill the gap in front of the autonomous vehicle. You could get the same result by training 5% of humans behind the wheel not to drive like idiots. But human nature being what it is, that will never happen. Dogbert learn to use adaptive cruise control. You can set the length of interval between your vehicle and the next. Also. As soon as you get into the next lane guess what! You speed back up. I believe this already occurs innumerable times in the real world Dogbert. Dogbert have you rode in an autonomous vehicle? Then you don't know. Also the comments about real world drivers. Would you rather drive on the road with a driver who is particularly attentive if a bit over cautious (autonomous car) or.. The guy who has just drank a case of beer? How about the fellow who just polished off his 8 ball? How about the teenager who is absorbed by their phone while driving? How about Grandma who hasn't had here prescription for vision tested in the last 20 years? Know what I would choose. I try hard to think before I comment. Having done that, here are my thoughts. Humanity has invented the this technology which will save lives, reduce costs and speed transport; not what I would call a failure. Human drivers are inherently less predictable than software programs and software is much easier to standardize than is human behavior; that, by itself, will make transport safer and smoother. Autonomous vehicles will communicate with each other much more effectively than do human drivers; no more middle finger salutes or road rage incidents. Communication between autonomous vehicles means speeds can safely be increased, not reduced since autonomous vehicle reaction time will be measured in microseconds and the vehicle you are in will be in communication with every other between you and your destination. What problems will this create? A multitude of unforeseen disruptions are ahead of us and solving them will require the ingenuity of a whole new work force! With the current level of diligence regarding security with smart cars/devices I can see this turning into a nightmare really fast. Dogbert learn to use adaptive cruise control. You can set the length of interval between your vehicle and the next. Not the one I was driving. No option to close up the distance. But you can turn the adaptive function off. Also. As soon as you get into the next lane guess what! You speed back up. Of course. But it is not safe to begin to pass someone at low speed thirty yards behind them.